When I first came across MITTGRONAJAG Instagram I was blown away with her Pileas peperomioides. They are, till this day, the most amazing Pileas I have ever seen online. She is The Queen of Pileas. Hands down. We can only watch, be mesmerized and ask questions, because we want to know EVERYTHING, right? First things first, tell me something about yourself, where are you from & how long have you been taking care of plants? 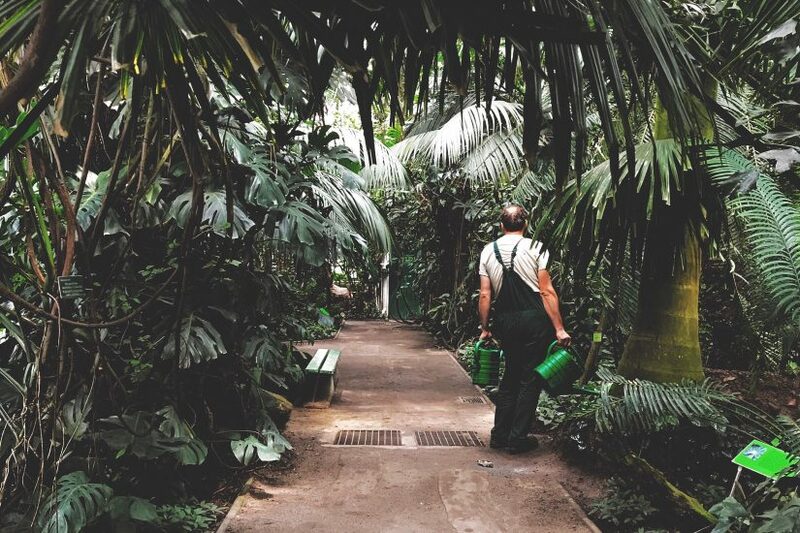 My name is Lisa, and I’m a plantmom living outside of Malmö, in the southern part of Sweden. I’ve had plants since I moved to my first apartment 12 years ago. 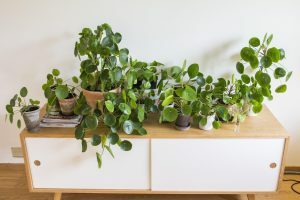 My very first plant love was a ficus bonsai that I even brought with me on holidays sometimes… Then I was on and off with my plants, killing some while others thriving, until my first Pilea peperomioides walked into my life a few years ago. From there I sort of went full plant nerd! Oh, in 2014. I had seen Pileas on an interior design blog but they were super rare at that time. I managed to find one in a great plant shop in Malmö. It was a small one, but quite developed plant with several steams already. I had absolutely no idea how to care for it but we hit it off immediately. I always found Pileas to be one of those no-fuss plants that just works, like a monstera or a cacti. All of them look so lush & healthy! So the most important question is (for all of the folks out there) – How do you care for them? Please share your daily routine! Thank you! Well, first things first, I keep my Pileas in a not too bright location. I know some people say they love sunshine but I find mine become very light green and almost transparent when kept in a south-facing window. 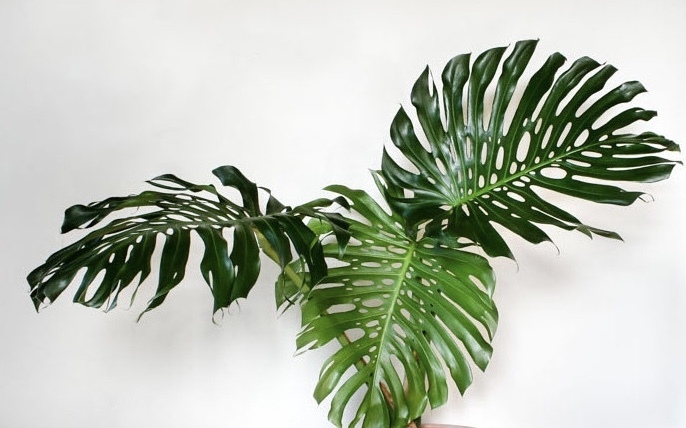 I keep them in a medium light conditions and that gives them large, very dark green leaves. They are always in the same spot all year round, but in the long swedish winter they tend to lose some leaves. I don’t fuss about it too much – there is always so much growth in the spring anyway! I water my Pileas about once a week, but not until the soil is almost completly dry, and some fertilizer about once a month spring to autumn. It’s quite easy with Pileas to see when they need water because the leaves start to hang. How often do you propagate? 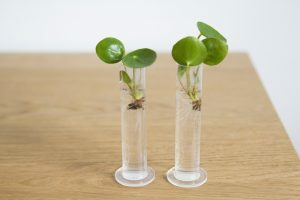 How do you care for the cuttings? Propogation is the most fun part of Pileas! I usually end up with waaay too many babies! I only take cuttings spring and summer – I have tried it in winter but they never grow until spring anyway, so I wait. I use a soil mix for succulents & cuttings which has good drainage. I don’t fertilize much. I repot them after about a year. Generally, Pileas don’t mind a small pots, so don’t be afraid to put the babies in all kinds of small pots and containers. 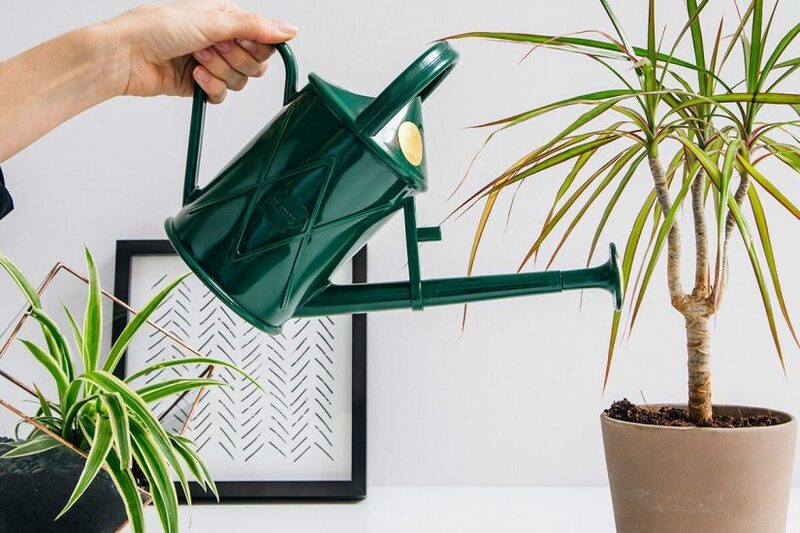 Don’t forget to water the cuttings a bit more frequently than you would an adult plant if you pot them in soil straight away. 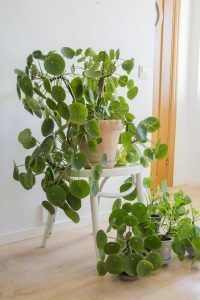 My favorite is of course my mama Pilea – or I should probably say great-great-great grandmother by now! 😉 She is the first I got and the mother of so many babies. And she still looks gorgeous! 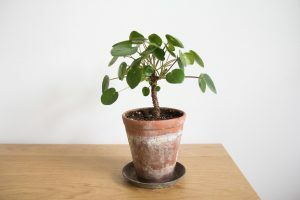 I also have a Pilea which I turned into a small bonsai-like tree which is also cool. Pileas are very tolerant to experiments so don’t be afraid to try different looks with them! 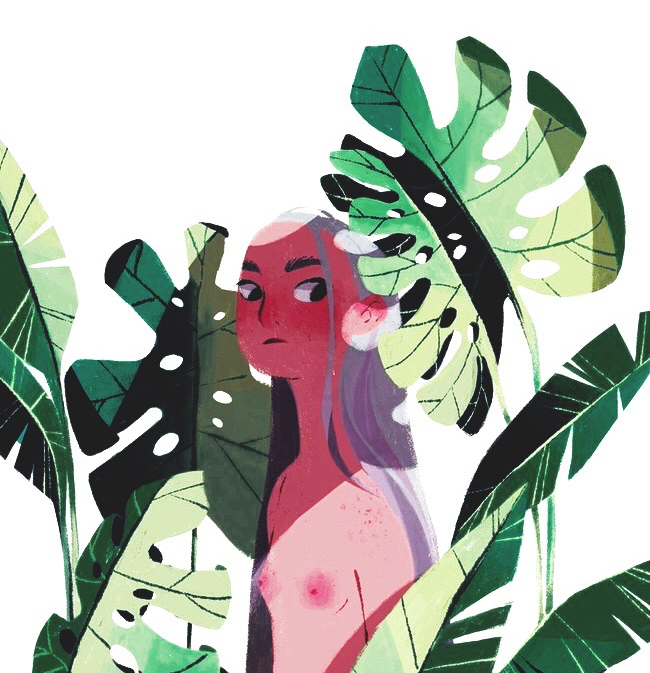 How do you picture your life with plants five years from now? 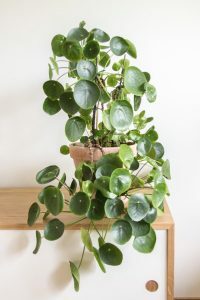 Right now I have a human baby as well as my plant babies which means that all plants are confided to spots where his little fingers can’t reach – Pilea’s leaves especially are very fun to pull out! 😉 So in five years I hope they are everywhere in the house again. Plants are my all time favorite decoration and I love surrounding myself with them. Thank you so much Lisa for taking the time and answering all of the questions! May your 2018 be filled with even more baby Pileas! All of the photos are Lisa’s.